If smart watches usually can only be used for jogging, riding a bike or swimming. Accordance in fact has the smartwatch is suitable for playing golf. The smartwatch is Accordance Garmin Approach S60. Watches are equipped with advanced bervagai features to support you as a golfer. Garmin Approach S60 itself is a watch that has the appearance of a colored touch screen measuring 1.2 inches. GPS equipped, thus supporting users who like to play golf. Garmin Approach S60 capable of storing data and information on more than 40,000 golf courses are there in the whole world, and will be constantly updated. Not just that, it also able to display the mapping of the golf course can be seen a golfer watches directly from them. Garmin Approach S60 can also automatically detect and record the location and distance of each blow, and then upload it to the account of a user that is in the application of Garmin Connect. Then this recording data will be analyzed after golfers finished playing golf. Garmin Connect application can also be used to update the data of the golf course is most often played by golfers. If you love to play online, Garmin Approach S60 is also able to provide it through the application of Garmin Golf. With this application you can compare the rating of golfers who are both using this application, despite playing at a different golf course. So as you play online. Applications that can be downloaded for free can also make it easier for users to compete with fellow golfers on the course. Because it could make it easier to see the rank, score, handicap and from other players. 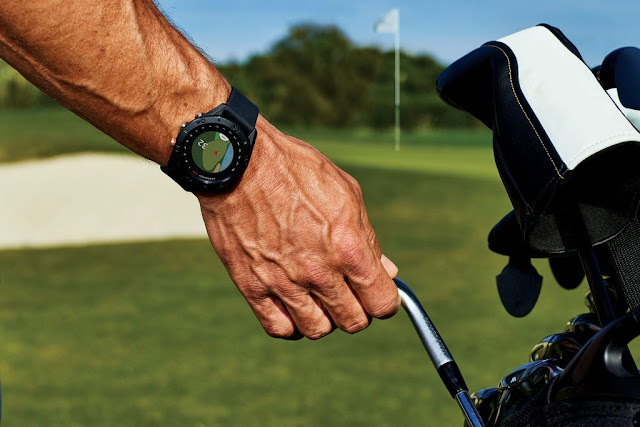 This technology also provided smartwatch Garmin AutoShot, which made the golfers can easily check back, mapping, and analyze all the blows were detected in each round of the game. Golfers can also use the data to compare AutoShot stats from the previous round, check punches every golfers, and analyze the blow while you customize how to play. Garmin Approach S60 can also measure the relationship between swings upward and downward swings. There is also the TempoTraining feature, which uses vibrations to help users sync how to swing a golf stick and adjust the tempo ayunannya. Don't miss the features of Garmin TruSwing, which makes these watches can tell the user how much speed stik golf swing and the angle to fix the blow. Garmin Approach S60 provided battery that has the active period for ten hours if used to play golf, and up to ten days if used only as a normal wristwatch. Garmin Approach S60 is also able to deal with a variety of weather conditions, such as heavy rain or a sweaty golfers while hot days. Can even survive in water to a depth of 50 meters. Designed with a sleek and stylish design, this watch can also be used for outside-style golf course. The elegant appearance of the use of the popular brand of wristwatch straps QuickFit, which can easily fit snugly in a matter of seconds, without any tools. Strap watches are available in a choice of black and white, and there are several choices of materials, namely, silicone, skin, or stainless steel. Development of device technology more advanced Smart Watches only one combined as a fitness tool. As one of the newest Garmin Smartwatch claimed able to track a person's stress level. Is smart watches Garmin Vívoactive 3 which dibanderol with price from Rp5 Million are provided with features that are fairly complete. Thanks to the technology of monitor data HRV (heart rate variability), smart watches has the ability to see the current level of stress from the wrist of its users. Thanks to Garmin Connect stress levels can be identified through the patterns that occur and consider lifestyle changes. The level of Stress in a long period of time can be known quickly. Users can also use the timer feature Four-Fold Breath relaxation, which can help users to balance stress and time off. Measure heart rate measurement via the wrist from Garmin is also very easy to do, thanks to this feature ElevateTM which will monitor for 24 hour fitness for memantar users. As fitness gauges, watches smart also has a VO2 max, thus providing valuable data to users in their personal fitness monitor. The increase in activity will make the numbers are getting good over time. Smartwatch Garmin also comes with thousands of watches and display of the widget. With an attractive display so we could adjust the vívoactive 3, making it the most fitting accessories to play and hang out. To navigate in Vívoactive 3, users can use the Side i.e. SwipeTM controller with scrolling and menu navigation, widget, stats and more quickly. Navigation can be used both to perform a scroll with the thumb or index finger. Vívoactive 3 has a design that can be worn in any orientation that felt most comfortable.It has a sturdy design and elegant Smatrwatch vívoactive Garmin 3 shows details of the delicate finish of stainless steel. from the side view is available with high resolution screen Garmin ChromaTM that always lit for easy to read in all lighting conditions. Users can also download the application available for free from Garmin Connect IQTM. It has also been available 15 applications or outdoor sports. Vívoactive 3 secure brought swim and mandi2, as well as having active period of up to seven days in battery mode and smart watches 11 hours inside a GPS3. Vívoactive 3 comes in three colors, black/white and stainless/stainless (with a suggested retail price of Rp 4,999,000), and black/slate (Rp 5,499,000) and can be purchased at Urban Republic, Erafone Mega Store, Erafone, and all authorized resellers start 24 December 2017. 0 Response to "Cheaper, This Smart Watches Suitable For Golfing"